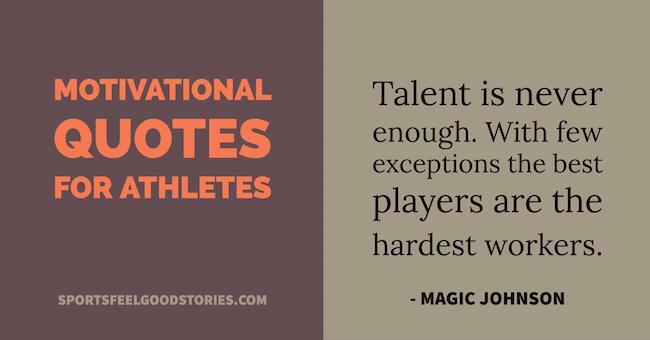 Motivational quotes for athletes have long been a way to provide that little extra inspiration for top performance. They say its 1% inspiration and 99% perspiration – but that 1% can go a long way. You cannot achieve anything big as an athlete if you are not motivated 100%. Ask any successful athlete and they will tell you that it’s all in the head. Preparation and hard work are critical, but it all starts with motivation. It is the fuel that drives a performer to achieve great things and the same principles apply to life too. So whether you are a young athlete, an old vet, or an accomplished performer in any other pursuit, being motivated is critical. Here are some of the best motivation quotes for athletes and everyone else to boost their confidence and to inspire them to achieve greater heights in their career and life. Football doesn’t build character, it reveals character. Tip: Motivational quotes for athletes can be used in team emails, texts, Instagram captions, Facebook posts, programs, award certificates and more. If you want to find the real competition, just look in the mirror. After awhile you’ll see your rivals scrambling for second place. Adversity causes some to break; others to break records. I am the greatest. I said that before I knew I was. If you accept the expectations of others, especially negative ones, then you’ll never change the outcome. If plan A doesn’t work, the alphabet has 25 more letters – 204 if you’re in Japan. If you push me towards a weakness, I will turn that weakness into a strength. Sportsmanship for me is when a guy walks off the court and you really can’t tell whether he won or lost, when he carries himself with pride either way. I don’t think being an athlete is unfeminine. I think of it as a kind of grace. If one can stick to the training throughout the many long years, then willpower is no longer a problem. It’s raining? That doesn’t matter. I am tired? That’s beside the point. It’s simply that I just have to. I don’t plan on being disappointed. We plan on being really good, and obviously we plan on winning. In the end, it’s extra effort that separates a winner from second place. It takes desire, determination, discipline, and self-sacrifice. Put all these together, and even if you don’t win, how can you lose? George Halas – Learn more about the Chicago Bears. What to do with a mistake: recognize it, admit it, learn from it, forget it. If you have any suggestions for additions to motivational quotes for athletes, please use the Contact page and let us know. Thanks!